Hey all! I hope you had a very merry Christmas (or whatever holiday you celebrate this time of year!). I'm headed back to St. Louis after a great time with the hubs's family in Texas, and I've been thinking: I need a period of refreshment. Some time to relax, some time to catch up on plans for the online store, and some time to plan future posts for the blog. 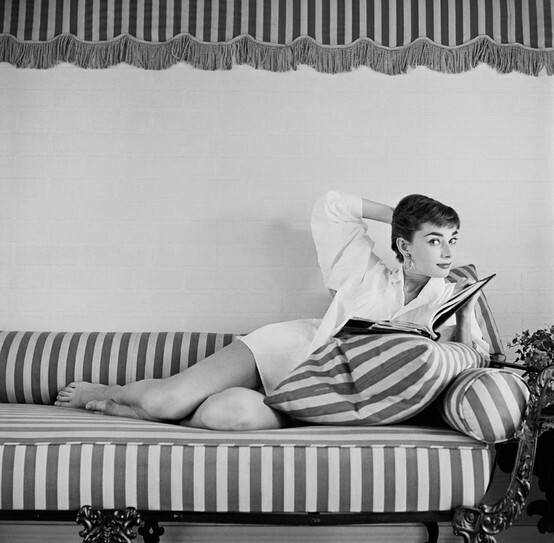 So, I'm going to be like Audrey up above (sans that fabulous striped couch): don my comfy robe, break open my brainstorming notebook and just enjoy some time spent in creative thought. I'm already inspired just thinking about it! Just discovered your blog through reading the latest issue of Country LIving Magazine. Congratulations on your award! That's awesome! I'll look forward to checking back often and enjoying your great looking blog. Happy New Year!